Every cell, tissue and organ in your body contains the macronutrient protein, which provides your body with energy. The digestive process breaks down protein in food into amino acids that repair and replenish the body. Protein helps build muscles, produce new cells, regulate hormones and enzymes, heal wounds and promote immune function. Low dietary protein is most common in developing countries due to inadequate access to protein-rich foods. However, it can also affect people in developing countries who make poor dietary selections. Insufficient dietary protein can result in many negative side effects. A lack of protein in the diet can cause muscle soreness, weakness and cramping. Protein supports muscle growth and strength. A lack of protein in your diet reduces muscle strength, muscle function and decreases lean body mass. You also lose body fat, because protein provides structure for adipose tissues. The wasting away of muscle and fat tissue is known as cachexia. Edema causes fluid to accumulate in the tissues and cavities of the body. Edema most often affects the abdomen, hands, ankles and feet. Protein helps regulate and maintain a proper fluid and electrolyte balance within the body. 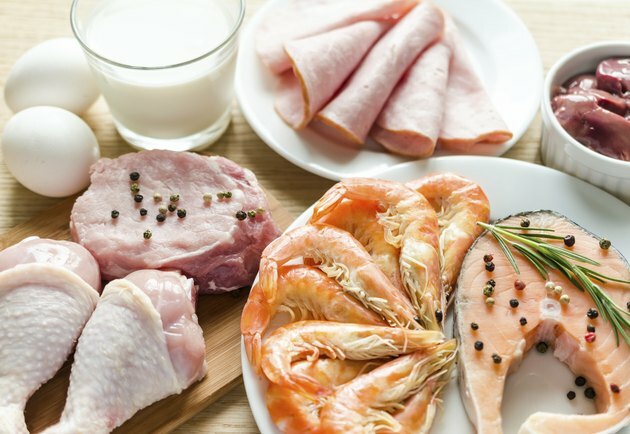 Not getting enough dietary protein can affect your body's fluid and electrolyte balance, causing swelling and edema. A lack of protein in the diet can cause changes in your skin and nails. Protein enables cell regeneration, produces new cells and replaces dead ones. Therefore, if you do not consume adequate amounts of protein, your skin may become very light and burn easily when exposed to sunlight. You may experience cracking, flaking, dryness and rashes of the skin. Delayed wound healing and ulcers are signs of low protein intake. Protein aids nail formation. Protein deficiency can cause white bands or brownish spots on the nails. Dry, sparse hair that falls out easily or changes color or texture is a sign of low protein intake. Hair contains 90 percent protein. Protein deficiency results in thinning hair or hair loss. According to the Institute of Medicine, adult females require 46 grams of protein per day; adult males need 56 grams of protein. Your immune system needs protein to protect your body and defend against foreign substances such as bacteria and viruses. When your body does not have the right amount of protein, the number of new white blood cells decreases. This results in a weakened immune system and increased risk of infection. Low protein stores cause you to feel lethargic, fatigued and weak. You may also experience headaches, nausea, diarrhea, soreness of the stomach and even fainting. Protein helps transport nutrients within the body, delivering and releasing them where they are needed. When protein cannot perform this function, it disrupts the body's homeostasis. This may result in a loss of appetite, irritability, insomnia, apathy, and the inability to stay warm.